The Spanish enjoy drinking Brandy de Jerez and have the statistics to prove it. In 2008, over 64 million bottles were sold, and of those, over 36 million were sold in Spain. At present, approximately 80 million bottles are produced each year, of which about 20 million are exported. With such high consumption levels, it is no surprise that brandy production in Spain has a long history. The Spanish have been producing distilled spirits since the Moors brought the technology of distillation to the Iberian Peninsula in the year 711 AD. Although the Moors were prohibited by their religion from drinking alcohol, they used distilled alcohol to produce perfumes, as well as for medicinal purposes. By the 16th century, brandy was being produced in large quantities in the area of Jerez, and by the 18th century was being shipped around the world. Today, 95% of brandy produced in Spain is Brandy de Jerez, (Brandy from Jerez) and is protected by a DO (Denomination of Origin). It is produced only in the Jerez region of Southern Spain; has a rich amber color, and an alcohol content between 36 and 40 degrees. Jerez, which is translated to English as "Sherry," is the name of both the region and the wine produced there. Brandy de Jerez is produced from wine made from the Airen and Palomino grapes. It is aged in sherry casks, called botas, made of American oak. These casks must have been used to age sherry for at least 3 years prior to being used to age the brandy. The type of sherry that has occupied the cask will affect the brandy's color, taste, and aroma. For example, a cask that was used to produce fino sherry will produce a paler brandy than a cask that was used to produce an Amontillado or Oloroso. It is aged exclusively in the towns of Jerez de la Frontera, El Puerto de Santa María, and Sanlúcar de Barrameda. According to the Consejo Regulador of Brandy de Jerez (Regulating Council), in order to obtain one liter of brandy, it is necessary to distill four liters of wine. The system used to produce sherries and brandies in Spain is called Criaderas y Soleras and works like this; a portion of brandy is extracted from the casks on a regular basis, and these extractions are called sacas. The brandy extracted is then used to fill other casks, and the filling process is known as rocios. The sacas and rocios occur periodically. Depending on the producer, this process can occur every 4 to 5 months or 1 to 2 years. The casks are generally stacked three high. From the bottom row, called the Solera, a quarter of the contents is removed to drink. An equal amount is removed from casks in the second row, called 1st Criadera, and poured into casks on the bottom row. From the top row, called Criadera, an equal amount is removed and poured into the second row. The casks in the top row are then filled with new wine. This simple system of mixing old and new creates a very consistent and homogeneous product. 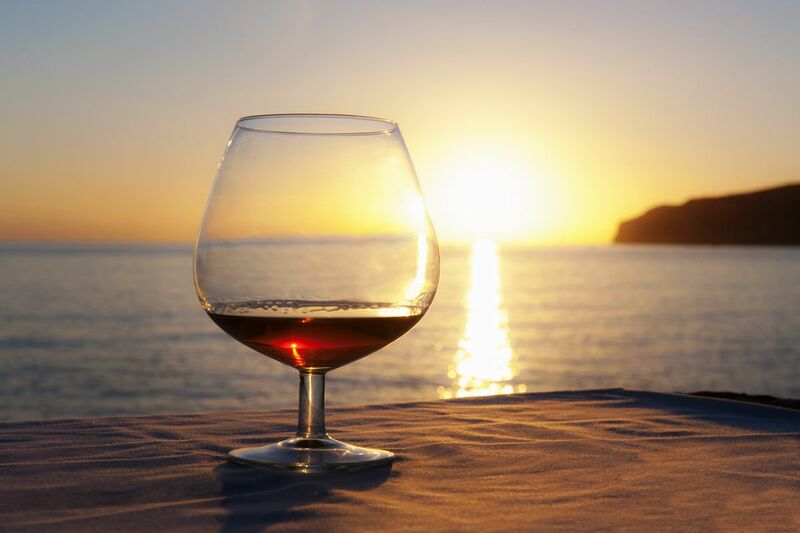 The Spanish say that the older, high-quality wine or brandy "teaches" the younger, newer wine or brandy. Brandy de Jerez Solera - The youngest brandy, it has been aged an average of 1 year and has a fruity taste. Brandy de Jerez Solera Reserva - This brandy has been aged for an average of 3 years. Brandy de Jerez Solera Gran Reserva - This is the oldest brandy, aged for an average of 10 years. There are over 30 producers of Brandy de Jerez in Spain and most readers are already familiar with one of the brands, or at least the brand's symbol; the black bull. Those huge black bulls that have dotted the Spanish countryside for decades were originally an outdoor advertisement for the brandy Veterano, produced by Osborne. The bull remains a symbol of the Osborne brand and has become a Spanish cultural icon. Alvaro Domecq produces Fundador and Duque de Veragua. Osborne produces 14 different brandies, including Carlos I, Carlos I Imperial, Carlos III, Magno, Toro. Gonzalez Byass produces several different varieties under the Lepanto label, as well as other brands. Williams & Humbert produces five brandies, including Duque de Alba.